182 pages | 12 B/W Illus. "This concise study examines the conflation of news media and the social phenomenon of individual citizens taking pictures and videos… Mortensen (Univ. of Copenhagen, Denmark) examines more than just the idea that the audience is now a partner in content creation; she provides several detailed examples… In contrast to books that offer broad examinations of journalism in the digital era (…) Mortensen's volume focuses precisely on the phenomenon of eyewitnesses as participants in the news dissemination process. Summing Up: Recommended." "In Journalism and Eyewitness Images, Mette Mortensen provides an original account of images in conflicts such as wars, armed confrontation, and terrorism. The ability of citizens or participants to produce, distribute, and use images at times of conflict challenges the control and shaping of mediated conflict experiences. 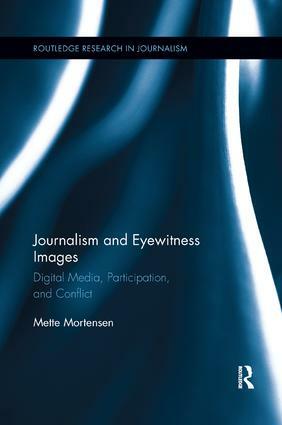 Mortensen offers a welcome account of the changing social relations and the ways eyewitness images have altered public access to information and news production." Mette Mortensen is Associate Professor in the Department of Media, Cognition and Communication at the University of Copenhagen, Denmark.